I’m a huge fan of all things related to hiking gear, but my favorite category has always been footwear. For me, it’s the most important piece of gear I choose for a trek or long hike. I can deal with a great deal of discomfort, but when it comes to my feet, things have to be dialed in. I’ve hiked and trekked in enough footwear to know exactly what I do and don’t like, but like most people, there is no one shoe that fits the bill perfectly. On top of that, I have different preferences and criteria that influence my choice of shoe for different hikes and trekking conditions. I will be carrying a pack weighing 15-25 lbs. Given these conditions, I can rule out any option that is a boot and/or has Gore-Tex. Why? Boots are way too heavy and I can’t stand the “support” they offer for the given conditions. I put support in quotes, as some studies have suggested ankle protection in boots does not decrease the incidence of twists and sprains. Ankle support is a preference though, weight is not. Gore-Tex (GTX), from my anecdotal accounts alongside many others, drenches your feet from the inside out. Not only does GTX trap heat into your shoe or boot, if you do get them wet, good luck drying them out. It could take days. If you’ve ever been in prolonged rain with GTX boots on, you’ll know they will eventually get wet. I don’t want to go too far on this point, but GTX is sold like crazy, and doesn’t do what people think it does. On Tour du Mont Blanc this summer, we had 7 days of constant rain and thick mud. People with GTX boots were just as wet as I was with my Salomon XA Pro 3D. The difference? My shoes drained and dried much quicker. Save the GTX boots for mountaineering and high alpine treks, they are not necessary on a walking path like John Muir Trail. The Ultra Raptor is number 1 on this list, as it is a shoe I am very familiar with, and have had a great experience with. The greatest test with this shoe was hiking 3 T’s Trail and Mt. Baldy in one day. That hike covered 20 miles with 8200 ft of elevation gain over 4 peaks. The 3 T’s Trail is rocky and the temps that day were pretty warm, a great simulation for JMT. I had no hot spots or foot discomfort, but I was only wearing a day pack. Still, this shoe hit’s all the right notes for me, they’re lightweight, 8mm drop, forefoot protection is superb, they’re breathable, and they’re very comfortable. The only downside is the outsole wore down pretty quickly. The trade-off is that it has the best grip on granite of any shoe I’ve ever worn. The uppers wore very nicely, but maybe some shoe-goo can help add some life to the high-wear areas on the bottom. I’ve also read a lot of blogs from people who have worn this shoe on JMT and it appears to be a sound choice. This is another shoe I have a lot of experience with, in fact, I logged more miles on the XA Pro 3D in 2014 than any other shoe I own. I wore this shoe for Tour du Mont Blanc, Mt. Whitney, Half Dome, and many more great hikes. The best parts of this shoe are the great stability, incredible durability, and quick-lace system. The comfort is great in the heel and midfoot, but the toe-box can feel a bit cramped at times. The shoe breathes very well, but the thick overlays can cause some drainage issues. The outsole doesn’t have the grip of the Ultra Raptor, but it’s not terrible either. It’s a harder rubber compound that lasts a long time. This shoe has a plastic chassis that runs from the heel to the midfoot, with very pronounced arch support. It was a bit uncomfortable at first, but really grew on me as I carried a 20 lb. pack around Mont Blanc. The forefoot uses a dense EVA for push through protection, and this is one area I feel the shoe needs to improve. I can really feel the rocks after about 15 miles on a trail in the Sierras. The drop on this shoe is 10mm, which is higher than I like, but hardly noticeable in use. This is a frustrating shoe for me, because I’ve loved running and hiking in it, but the durability just isn’t very good. This is easily the most comfortable trail shoe I’ve ever worn, and one of the best looking in my opinion. The reason is simple, Altra uses a foot shaped toe box that allows your feet to relax and your toes to splay. It’s also 0mm drop. The inside of the Lone Peak is sock like, with no hot spots or rubbing. The fabric used is really great, as it’s highly breathable and drains well without letting in a lot of dust and debris. The underfoot protection of this shoe with the integrated rock plate keeps my feet protected from all the little bumps along the trail. The only reason this shoe isn’t a no-brainer for me on JMT is due to the outsole. The pair I have deteriorated pretty quickly on some very tame trails, and have since, lost all grip. I still wear them on fire roads, but I don’t know if I’d trust them to hold up on John Muir Trail. Maybe I’ll give another pair a try and see. The New Balance MT1210 V2 is a shoe I have not worn, but that doesn’t mean I’m not considering it. I read a lot of really great things about V1, and saw a lot of them out on the trails this year. I tried the V1 on, but the heel felt a bit sloppy and the fabric of the upper was too thick. The other strange thing was that the tongue was too short. It looks like all of these things have been corrected for V2, so I’m really excited to try them on. The great thing about the MT1210 is that they’re built for ultra races. I could feel this on my feet, as they were very socklike, with incredible cushion and rock protection. The outsole is Vibram, and had great grip on tile. The lugs are very shallow, which is good for racing (no trips), but I’d be interested to see how they fare on loose gravel or mud. I’m probably going to get my hands on a pair pretty soon to try on, and I’ll update this post when that happens. This is a shoe I really want to like, but the fit just doesn’t feel quite right. It’s the most popular trail runner for PCT and JMT hikers, so what’s wrong with me!? From trying them on, the toe box is too pointy, the midfoot is too narrow, and the tongue is not gusseted…but still, there is something about this shoe that makes my foot want to hike. Maybe I’m just succumbing to the power of groupthink, and assuming that if it works for that many people, it must work for me. I don’t know, maybe I should try them on with Superfeet, but if I have to force myself to like them, I should probably go with another option. I can just remember when the Saucony Kinvara first came out and they were all the rage. I tried them on, and like the Cascadia, wasn’t sure of the fit. I ran in them anyway and loved them. They took me to a PR of 1:39 for a half marathon. As you can see, I have a few choices to pick from, with the Ultra Raptor and XA Pro 3D leading the pack. I’m going to be logging 300-400 training miles before July, so I’ll get to do a lot more testing before making a final decision. Unlike day hiking, you have to get your gear choices dialed in on a long distance trip. If you get blisters, your shoe falls apart, or you encounter other problems, you may be a long way away from any solution. I hope you found this write up helpful, and if you’re wearing a shoe for JMT not on this list, please leave me a comment in the section below and let me know which one. Thanks! I ran and hiked in a pair of S-Lab Wings XT 5 and really liked them. The problem was the narrow toe box. It will be interesting to see if this has changed in this new model. I’m not sure on the release date of this shoe. I’ve done a lot of hiking in the La Sportiva Crossover 2.0 this winter and love them. The Mutant looks very similar, and have me very excited! This shoe will be available in late March. The All Out Peak is a very interesting shoe to me. I’ve read a lot about the Vibram Megagrip outsole, and it has all been very positive. It has a molded nylon arch shank and a trail protection plate. The last of the shoe also looks about as good as I’m going to see outside of Altra. I’ve never worn Merrell before, but this could be my first. I’ve always loved the build and last of Inov-8, but haven’t had much luck since my original pair of Roclite 295s wore out. I tried the Race Ultra 290 last year, and they were just too stuffy. This newer versioin is lower to the ground and looks to have a much more breathable upper. I’m intrigued. This shoe is available now. I read a lot of really great things about the Montrail Masochist II, but never tried a pair on. I do know they had somewhat of a cult following. Judging by the specs, this shoe marks off all of the boxes on my list. I’m interested! This shoe will be available early in March. The Speed Ascent is a very interesting piece of shoe technology. With a rockered sole, speed lace system, and customizable lace grommets, I’d love to give this one a try. I have no idea when it will be released in the states, but I hope to find out soon. 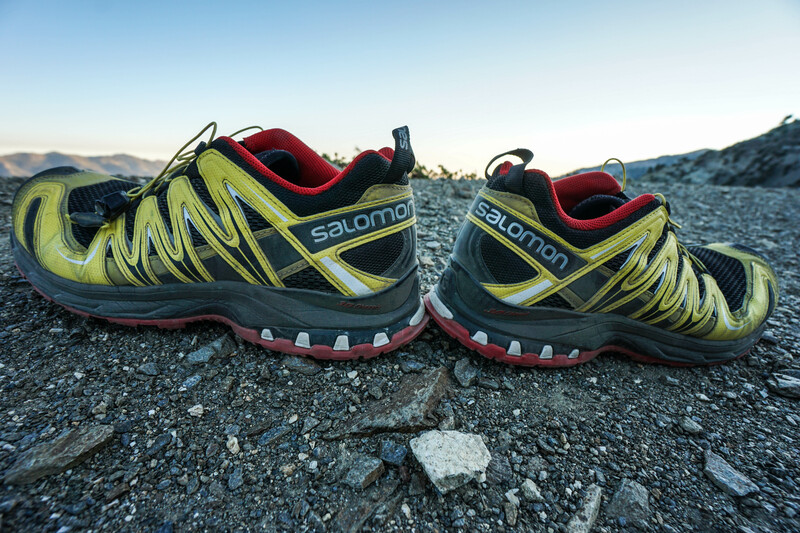 Check out the Salomon Sense Mantra. It has a lower heel to toe drop than traditional trail runners. I think its 6mm or something close. Thanks for the comment! I actually have a pair of the Sense Mantra and Sense Pro that I use for trail running. I tried the Mantra for hiking a few times, but the toe box was a little too narrow. I really love the pro film forefoot protection and overall comfort of the shoe. Maybe I should try them in a half size up, as I like my running shoes to fit with a little more precision. This could be a good option. Thanks! For what it’s worth, I think my next hiking shoe is going to be the La Sportiva Ultra Raptor. I have the Cascadia 8s right now and though I love the cushiony support they give my feet I find them disastrous on wet surfaces. During my first hike with them I almost fell in a rushing brook and fell two more times, once messing up my knee pretty bad (Hike: Carter Loop). Traction and durability-wise I loved my Scarpa Zens, but they do not have the support for a long distance hike. Thanks for the input. I was wondering about the grip on the Cascadia. They have a really nice tread pattern, and I’ve read a lot about the durability, but slipping around on wet granite is no fun. The Scarpa Zens are great shoes! They have a new Scarpa Zen Pro that looks really nice, but the full leather shoes put me off a bit for drainage and quick drying. Let me know how you like the Ultra Raptors if you end up getting a pair! I was very impressed with my last pair of INOV8 Flyrocs. I probably won’t be able to find them again in Taiwan so I will probably use the Soloman XA Pro’s again. this shoe always works for me although I’m intrigued by the La Sportiva ones. The only small problem with them is that the sole isn’t quite stiff enough when walking on sharp rocks but use Sole insole fixed that. Back in 07/08 when I hiked the PCT everybody loved the Montrail CDT’s and I tried to hike in the them and didn’t like them at all. Different shoes work for different people so I don’t think it’s strange that the Cascadia don’t work well for you. I’ve read a lot of really great things about the Flyrocs. It’s a shame they were discontinued. Like you, the XA Pro’s always work for me. They’re not perfect, but very reliable. I agree different shoes work for different people, feet come in all shapes and sizes. Thanks for the comment! Thanks for the link, David! I actually just tried a pair on about a month ago. I live pretty close to 5.10 headquarters and they have an outlet on the premises. I went in to get some new climbing shoes and figured I would try on the approach shoes while I was at it. I really like the Guide Tennies and the Camp Four. The older model (that you linked to) was my favorite for hiking. They have a new model that was really nice too, but much less of a hiker. Sizing seemed to change a great deal. I was a 13 in the old model, and an 11.5 in the new! If I can find a pair of the old ones at the outlet, I might give them a try. It’s not just the weight I worry about with the Camp Four, it’s the leather uppers and how they would dry out after a rain or stream submersion. I guess I could coat them with Nikwax and see how they held up. If not for JMT, they look to be a great daily hiker for everything else I do. Thanks for the comment! The tread on the Cascadias is garbage. I assume it’s actually the rubber compound rather than the tread pattern, as mine look immaculate but have trouble even on hard-packed dirt. No joke. I want to like the shoe as the cushioning is great and older versions can be found cheap, but they’re bloody ice skates on anything wet and rocky and the fit is a bit mushy for my foot. Now that you’ve had time in the Mutant, would you stick with the Raptor over it? I loved to OG Raptor and need a long-distance shoe. I’m also considering the NB 1210, but have been a La Sportiva fanboy for years, as they fit my feet. Also: You have a truly killer blog! Thanks for the input, I’ve seen this from a few other commenters and am glad I didn’t keep the pair I ordered. I’ve been wearing the Mutant and the Raptors a lot lately. I prefer the Mutant for fit, feel, and performance, but wish they had a little more underfoot. When I do back to back long days, I find myself reaching for the added forefoot protections of the Raptors. They make for a nice combo. I tried on the NB 1210 and really like them, but like you, am a big fan of La Sportiva!